1. 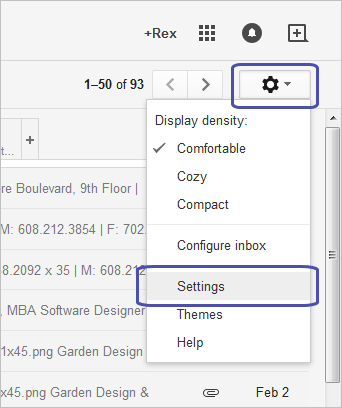 Sign into Gmail and click the GEAR icon and pull down to SETTINGS in the upper right. 2. Scroll down to the “SIGNATURE” section, click the bottom radio-button (little dot) to turn your signature on, then PASTE your signature into the edit window. Note: If you want to input any of your own text in addition to the signature we’ve created for you, please type and format that text first, and then do your pasting of our signature as your last step. This will prevent you from accidentally damaging any of the hidden formatting code we use to activate links, etc. 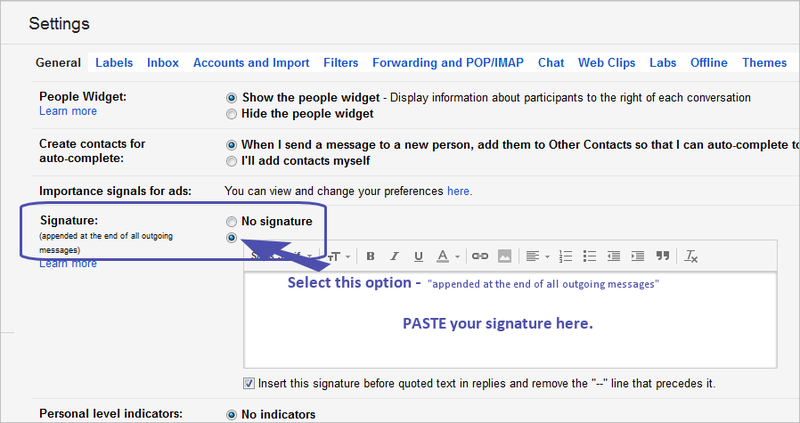 If you paste first, then use your keyboard to further modify the signature you risk damaging the hidden code. If this happens (you’ll know because your links won’t work), just start over from scratch. 3. Click SAVE CHANGES at the bottom of the page and you should be all set.